Villa Charlize is one of four villas of a private recently built complex, standing on the South west side of Mykonos in Aleomandra area, facing Delos and its colorful sunsets . 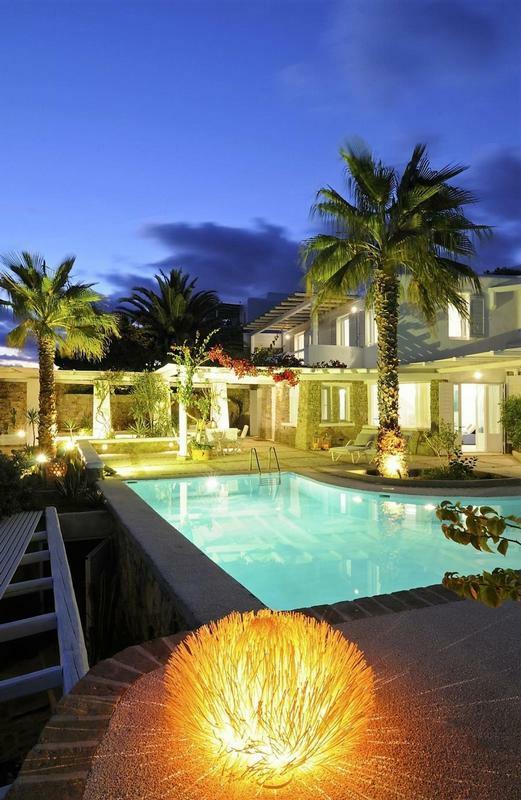 It is located 80 meters from the sea front in a well-protected by the strong northern winds area, offering magnificent views of the Aegean. The architecture of the villa is a flawless combination of modern and traditional Mykonian style. A minimalistic aesthetic lifts off the building, while the outdoor areas provide shade and fun, designed as they are to epitomize easy living. The house boasts a spacious white-marble terrace and superb L-shaped water-front infinity pool with comfortable wooden sun beds, promising relaxing moments all day long. The perfect combination of style, the incredible view and the location of this villa offer the guests one of the most unique experiences on the island. The ground level is dominated by a sizable open space living area having two comfort-able sitting areas, a dining area with glass table and modern dining chairs, a fully equipped modern kitchen with state of the art technology and ultra-modern black and white furniture, and a guest WC. One level up, the villa hosts Three master bedrooms with king size beds, en-suite bath-rooms and direct access to pergola-covered balconies with pool and sea view. There is also a guest house with independent entrance by the pool with king size bed, en suite bathroom and direct access to the pool. The outdoor area provides an L-shaped infinity pool which dominates the grounds, extended pool terrace with sun loungers, a large pergola with lounge furniture ideal for moments of relaxation, a covered sitting and dining area, plenty of open spaces and verandas with pergolas, gardens with flowers, cactus and other decorative plants, and a spacious parking area for two cars. I just wanted to praise the entire organization and the villa itself. The time I spent here was perfect. I just did not want to leave. A big surprise for me was a fully-fledged kitchen where I enjoyed cooking because I am a professional chef. There are plenty of places to relax, both by the pool and the living room where we relaxed. I should praise their restaurants and food, a very professional way of doing business. I also enjoyed long strolls along the beach.